Set in the heart of Les Gets, a few steps from the ski lifts and the main shops, Loc'Hotel Alpen Sports offers a swimming pool and a spa with a sauna, hammam and hot tub. The Loc'Hotel provides rooms, studios and suites with modern amenities including TV and free Wi-Fi internet access. They all have an equipped kitchen. 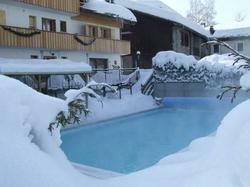 The heated outdoor swimming pool is open throughout the year. The hotel restaurant serves traditional mountain-style cuisine and the Alpen also has a bar. Guests are invited to relax by the fireplace in the lounge. Free parking and a private garage are provided at the Loc'Hotel Alpen Sports, making it easy to explore the Rhône-Alpes region by car. Please contact the hotel in advance to obtain the access code if you are planning to arrive late. This studio offers: - 4 single beds - free WiFi - a flat-screen TV - a balcony - a telephone - a safe - an en suite bathroom with a shower, a hairdryer and a heated-towel rail. - a kitchenette equipped with a refrigerator, a stovetop, an extractor fan, a microwave, a dishwasher and an electric kettle. This studio offers: - 1 double bed - free WiFi - a flat-screen TV - a balcony - a telephone - a safe - a private bathroom with a shower, a hairdryer and a heated-towel rail. - a kitchenette equipped with a refrigerator, a stovetop, an extractor fan, a microwave, a dishwasher and an electric kettle. This one-bedroom suite offers: - a bedroom with 2 single beds - a room with 2 single beds - a flat-screen TV -free WiFi - a balcony - a telephone - a safe - an en suite bathroom with a shower, a hairdryer and a heated-towel rail. - a kitchenette equipped with a refrigerator, a stovetop, an extractor fan, a microwave, a dishwasher and an electric kettle. This one-bedroom suite offers: - a bedroom with 2 single beds - a room with 2 single beds - free WiFi - a flat-screen TV - a balcony - a telephone - a safe - an en suite bathroom with a shower, a hairdryer and a heated-towel rail. - a kitchenette equipped with a refrigerator, a stovetop, an extractor fan, a microwave, a dishwasher and an electric kettle. This studio offers: - 2 single beds - free WiFi - a flat-screen TV - a balcony - a telephone - a safe - an en suite bathroom with a shower, a hairdryer and a heated-towel rail. - a kitchenette equipped with a refrigerator, a stovetop, an extractor fan, a microwave, a dishwasher and an electric kettle.